I was thrilled to be assigned Wendy’s blog A Day in the Life on the Farm for September’s Secret Recipe Club reveal. I had my sight set on her Morel Mushroom and Wild Rice Bisque (doesn’t that sound heavenly?!) but had a small hiccup. True story – I went to the natural foods grocery store and found dried morels, yet I opted out when 1.2 ounces rang up for $56. Yikes. Wendy wasn’t kidding when she said morels are like gold, I tabled that recipe for a night when I really want to “treat” myself or for a special occasion! 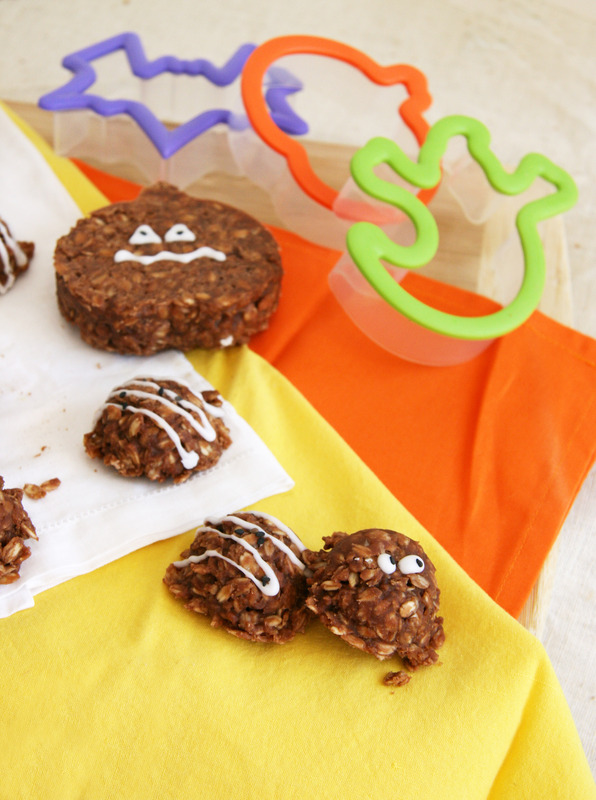 I happily chose her No-Bake Chocolate Oatmeal Cookies for this month’s reveal. Not only did I have a hankering for something sweet, but wanted something easy without much hassle (or maybe I didn’t want to wait on dessert). Once I was mid-recipe, ambition and creativity hit so I couldn’t help but whip out my cookie cutters for a little Halloween fun! Add first 4 ingredients into a 4 qt. saucepan. Bring to a rolling boil over medium-high and hold one minute stirring often. Remove from heat. Add sunflower seed butter (or other nut or peanut butter) to hot mixture and stir until melted. Add vanilla and sea salt and stir well. Mix in the oats and flaxseed meal, then stir well. Place cookie cutters on parchment paper and press mixture evenly into cookie cutters (make sure to press down to get into small creases) OR drop by tablespoons onto parchment paper. Let cool until set. Carefully remove cookies from cookie cutters after completely cool. If decorating, melt coconut butter until it reaches a liquid state. I put the whole jar in simmering water for a while and stirred occasionally and then scooped about 3 Tbsp out. Spoon liquid coconut butter into a small plastic sandwich bag and cut a small corner off to create a tip. Pipe over cookies to decorate and use tweezers (or tiny fingers) to place sesame seed “eyes” or sprinkle over the cut-outs. *I used less because I didn’t want these cookies as sweet, it’s up to you! You could probably use agave, maple syrup or honey but I haven’t tried it with this recipe. Those are darling…uh…I mean spooky! Great SRC choice! I cannot even stand how awesome these cookies are!!! I love that you pulled out the Halloween cookie cutters! Happy reveal day. These are so cute!! I love that we’re already thinking Halloween. 🙂 Putting candy eyes on ANYTHING is a great easy way to make things spooky! How cute! Will definitely need to try these. you did an amazing job. I didn’t even recognize this as my recipe!! Adorable! 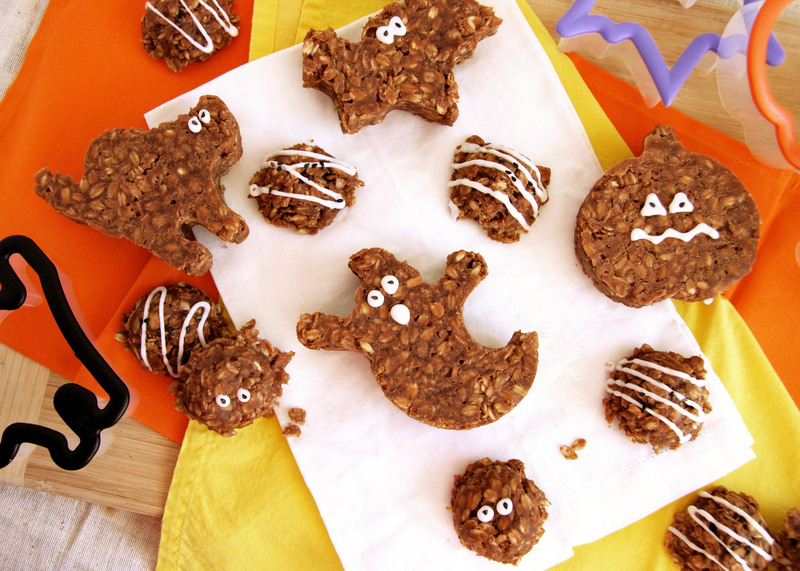 How festive are your Halloween cookies?!?! Yes, to quick and easy dessert. Happy Reveal Day! One of my sons adores no bake cookies, I never thought of cutting them out into shapes though. Great idea! 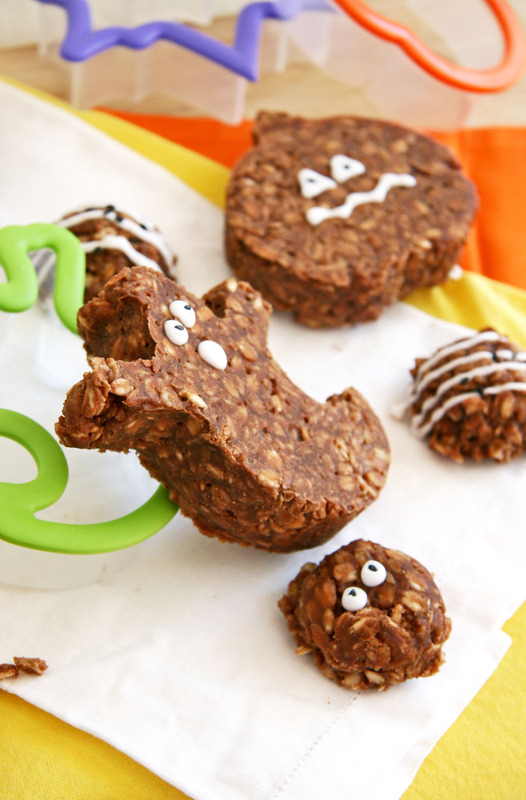 I have been searching for good no bake cookies! These look great! And spooky! What a fun project for Halloween!!! 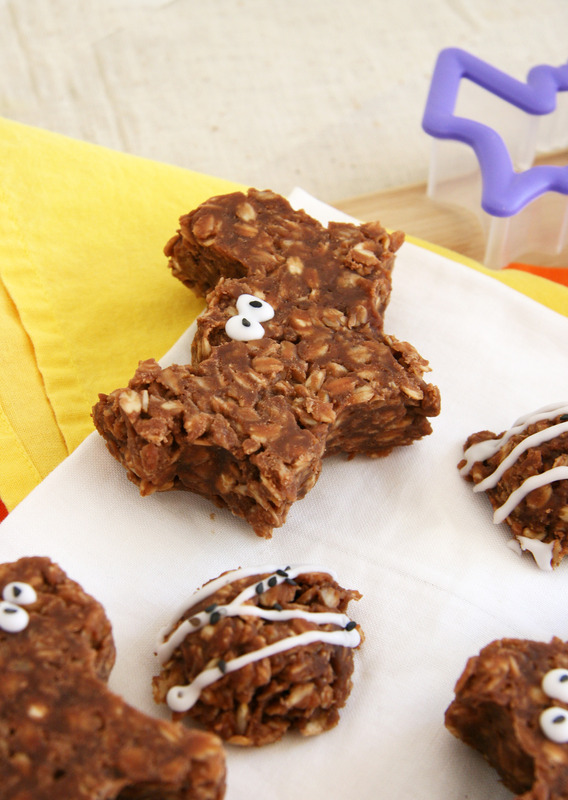 And I love that these are no-bake! Great pick this month.